All 16 boxes come in the single colour of your choice. 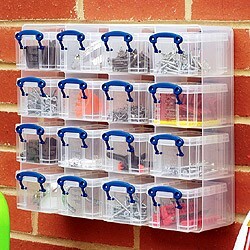 The divider tray is clear and contains the 16 boxes and comes complete with screw holes for mounting on the wall. This Organiser Pack fits perfectly inside an 11 litre XL Really Useful Box, which is ideal for transporting the pack or storing multiple packs. 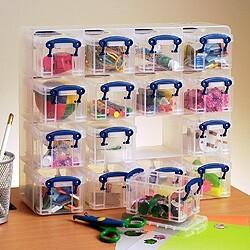 Please see the 11 litre XL Really Useful Organiser Pack if you would like to buy both items together.